Many schools use bean seeds for lessons on plants because the seed is so large, particularly the lima bean seed. The bean has two different embryonic leaves. Since it is so large, you can see all the parts with little magnification. This makes the parts particularly easy to study. 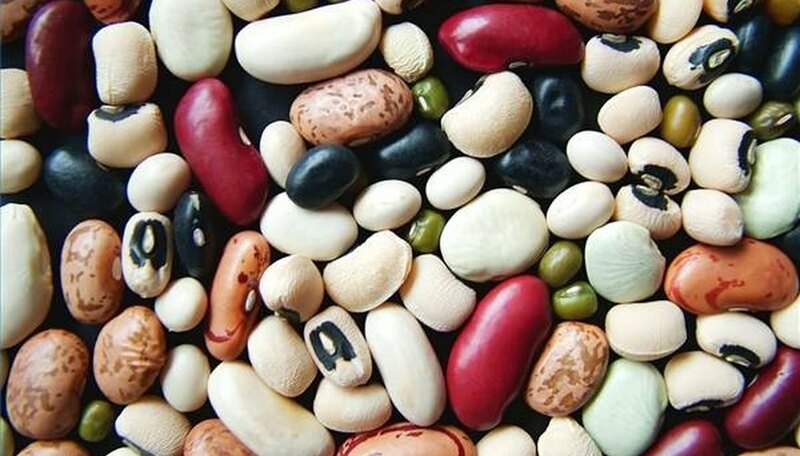 There are 19 genera of beans, with the lima bean from Phaseolus genus. Select any type of bean. Whether you use a fava bean, a lima bean or a kidney bean as the seed you study, you'll find that they all have the same two sides, which make them a dicotyledon. The term cotyledon means "seed leaf" in Greek. These are the two sides that poke up first and then open to reveal the first real leaf. The cotyledon feeds the plant until it makes its own food. Most of the interior of the bean is the cotyledon. Understand that the bean is actually the seed of the plant. It is in a seed case, the pod. You eat the bean and the pod when you eat a green bean, but only eat the seed when you eat kidney beans. Inside the green beans you eat are small seeds. If you let a green bean grow for a long time, the pod thins as it feeds the seeds and they grow into the seeds gardeners and farmers plant for the next year. Regardless of the type of bean, the parts of the bean seed are the same. Check the outside of the bean. The outside of the bean seed is the seed coat. This keeps the two sides together and protects the cotyledons. The bean sheds its seed coat when it germinates, or starts to sprout. The part that curves in and is rough on the bean is the hilum. It's the scar where the bean attached to the pod. Look for small parts on the inside of the seed. The first part is the plumule. This looks like a tiny stem and leaf, which it actually is. This small stem and leaf become the stem for the bean plant and the first true leaf. The cotyledons look like leaves when they come out of the ground, but you can tell the difference. The cotyledon has rounded edges. Find what looks like a round worm under the hilum. This is the radicle. The radicle eventually becomes the root. When the plant grows, the radicle grows downward and then is the main root of the plant. It develops secondary roots from it to anchor and bring in water and food from the soil to the plant.